Summer Rokytnice offers inexhaustible amount of marked tourist trails and paths, cycle tracks. Educational track „Around Rokytnice“ will lead you through picturesque country of Rokytnice region. 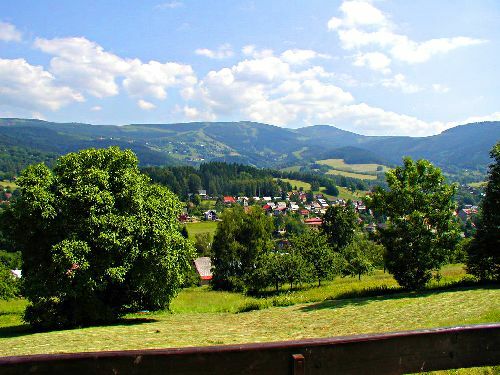 You will be able to experience beautiful views over the whole Rokytnice valley, Giant Mountains as well as Jizerské Mountains. Come and follow the tracks of long past smugglers and try to pass into the times when the Giant Mountains ridges and hillsides of Rokytnice nad Jizerou witnessed thrilling pursuits among smugglers and keepers of the boarder. This trail is devoted traditional cultural event „Wood sculpting“ that is held in Františkov – a picturesque part of Rokytnice nad Jizerou. This rock/observation poit that stands over Rokytnice offers marvellous views of the whole Rokytnice. There are five chapels in Rokytnice – chapel of Kostelní vrch, chapel by seculer linden, chapel on the rock, chapel by the Hotel Starý Mlýn, chapel in Františkově at Háskov. The waterfall in Rokytnice nad Jizerou, which falls from a height of 20 m. The waterfall is fed by the Huťský stream that springs beneath Dvoračky chalet. Chalet Dvoračky is situated an altitude of 1140 meters above sea level between Lysá Mountain and Kotel Mountail, on the crossing of marked tourist trails and paths. A nice trip for the whole day. You can take chair lift „Horní Domky“ beneath Ručičky. From Ručičky you can go to the cottage Dvoračky, then through saddle to Růženčina zahrádka, farther to Elbe Meadow. The oldest neo-Gothic stone observation tower in the west Giant Mountails. Štěpánka is located near Příchovice (11 km). Jizera Mountains – village Jizerka – 20 km. Jizera Mountains are named after the river Jizera, which spring here. The Jizera Mountains are characterized by moss. The waterfall is located in Poland on the outskirts of the village Szklarska Poręba (23 km). 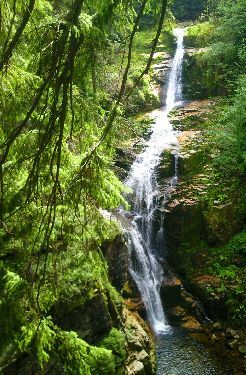 It falls from a height of 27 m. The waterfall is fed by the Kamieńczyk stream.